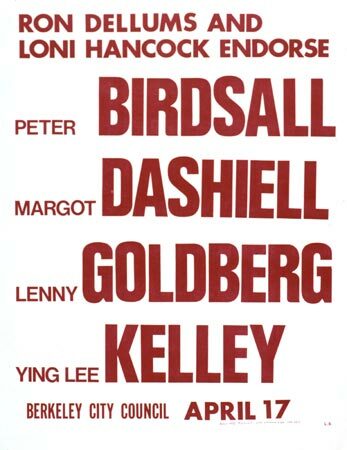 The April Coalition's last slate of candidates in 1973 barely ended up with a poster. The ideological faction objected to having the candidates in alphabetical order (ballot order) because that placed Peter Birdsall first. Peter was from the pragmatic/electoral faction. It was a stalemate. Such factional warfare made the 1973 April Coalition campaign extremely unpleasant, helping the conservatives to win three of four City Council seats. Jeff Gordon, campaign leader of the pragmatists, ordered this poster printed without permission, just to have a slate poster. Unlike 1971, and in contrast to their supporters, the April Coalition's 1973 candidates could work together, and they represented the best the progressive community had to offer. Once the April Coalition lost the 1973 election, it ceased to exist. However, Ying Kelley had been the one successful candidate, joining Loni Hancock on the City Council.